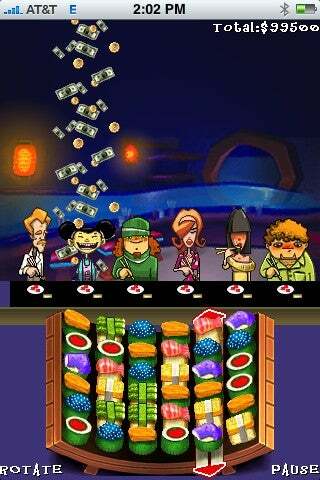 Sushi City is Cyberhull’s $1 fast-paced match-three game for the sushi lover. Unfortunately, like a bad sushi bar, Sushi City doesn’t feel so great after you take your first bite. Feed those hungry guests quickly before your sushi goes bad! Set in a sushi bar, you take the role of a sushi chef whose goal is to feed your hungry customers. To do that, you line up matches of three or more sushi horizontally or vertically. In Hungry Guest mode, you must keep serving those matches, or your guests will leave. In Happy Guest mode, you can serve all day long. Each match makes money. The larger the match, the more the money. Later levels gives you special types of sushi to match, giving you extra money or powerups. After certain levels, you unlock real sushi etiquette tips. You also unlock awards for certain actions, such as the longest chain of matches, or the highest monetary tip. Beyond looking at these tips and awards, though, they contribute nothing to the game. Unfortunately, technical issues get in the way. For example, matching sushi requires you swipe a row or column. But the accuracy of the swipe is so low that you frequently have to swipe multiple times to get the row/column moved far enough. The menu requires that you swipe to the item you want, then tap it…annoying and unnecessary. Also, the font size in the help and award section is very small, and difficult to read. The heart of Sushi City is the match-three which, after completing several levels, becomes rote. Add to that the technical issues and the questionable benefit of awards and tips which are just for show, and you end up with a pretty boring game. Then again, for a price of $1, you could do far worse.